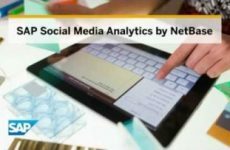 Turn massive volumes of unstructured social media data into meaningful insights – with SAP Social Media Analytics by NetBase. This cloud-based solution can help you quantify net sentiment with a sophisticated natural language processing engine – and correlate changes in customer opinion with campaigns, promotions, news, and other events. How much mind share has the new product captured? How is the social media component performing? How much buzz and passion do our competitors have? What are our opportunities and threats? Is that recall impacting overall brand perceptions? Are external issues going viral or fading away? What is our brand equity on the social web? Which social media posts require a service response? How are our overall customer satisfaction levels tracking? What does social media say about our competitors in this deal? Can combine SAP Social Media Analytics data with other SAP solutions. SAP Social Media Analytics subscriptions include API and export rights. As integrations become available, SAP Social Media Analytics data can be used with them with no additional charge. Integrations are in the proof of concept stage with BI, CRM, and other SAP solutions.